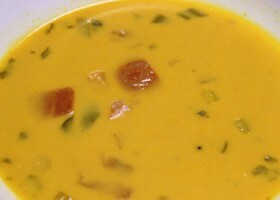 Elaine: Mulligatawny? Kramer: Yes, it’s a delightful Hindu concoction simmered to perfection by one of the great soup artisans in the modern era. Elaine: Who, the Soup Nazi? Kramer: He’s not a Nazi, Elaine. He just happens to be a little eccentric. Most geniuses are.